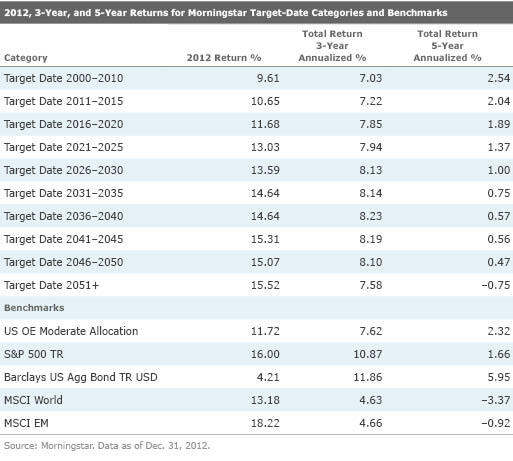 Things get worse when we look at MorningStar’s Target-Date funds, all of which represent Diversified Portfolios. The best 5 year annualized rate of return they can show is 2.54%! After five years, your best Morningstar DIVERSIFIED PORTFOLIO would be up by only 13%! Over the same time period your DIA only portfolio would have been up by 37%. Investors in most cases did well in target-date funds in 2012 whether they were just starting out in their working years or getting close to the retirement end line. The target-date categories for investors at least 20 years from retirement (that is, dated 2035 or later) produced average calendar-year returns of 14.7% and higher. That’s a solid absolute return by any measure, and within spitting distance of the S&P 500 Index’s 16% total return for 2012. “Within spitting distance….” for one year. Shouldn’t these diversified managed funds be doing much better than the Dow or the S&P 500? It should be noted that the DIVERSIFIED PORTFOLIO Target Date funds beat the DIA quite handily in 2012 but fall far behind in the 5 year analysis. This emphasizes the point that we are not interested in one year comparisons. My hypothesis requires at least a five year horizon.